Welcome to SNOWBOARDER Magazine's 2016 Rider Of The Year Awards Presented by Under Armour. 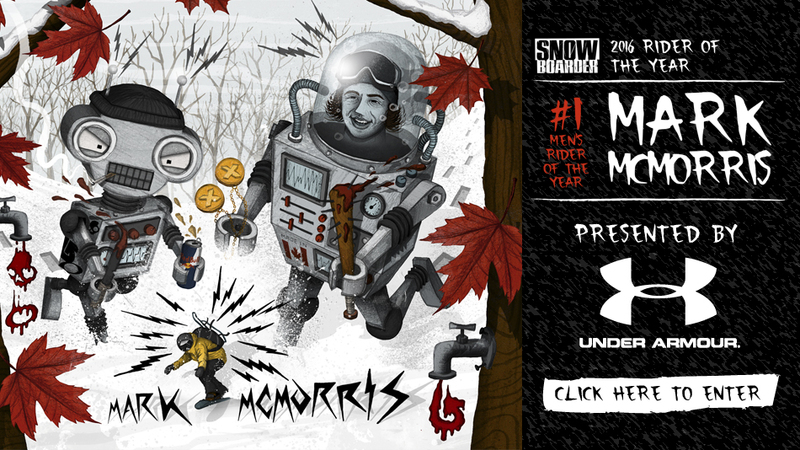 Since 1999, SNOWBOARDER Magazine has honored professional snowboarding's best with our Top Ten Rider of the Year Awards. What lends this title such acclaim is the fact that it is solely based upon the discretion and opinions of professional snowboarding's most elite club, those riders who have themselves appeared on our Top Ten Rider of the Year list. This means that when a pro receives this accolade they do so by impressing the likes of Pat Moore, Mark McMorris, Travis Parker, Gigi Rüf, Jeremy Jones, Marie-France Roy, Louif Paradis and more. For 2016, our Rider of the Year award rollout will once again be an exclusively digital happening. Each weekday from Monday, January 4th until Monday January 25th, SNOWBOARDER will highlight a different rider's achievement, culminating with the ultimate praise of naming our 2016 Rider of the Year.